Image: Data Reliability by Bryan Loar. Source Images: Volvo 262 c by and Courtesy of Andreas Nilsen, Car104 by and Courtesy of detritus. I recently came across my first postmortem LinkedIn profile. The profile led me to ponder that, in our age of social networks, a deceased person could have hundreds of profiles scattered across the web. Will their family leave the profiles up like roadside memorials (e-desconsos)? Or will they remain unchanged, like space debris floating in the netverse? In regards to data reliability, this could be a serious problem. Today, much focus is given to data curation, the ability to manage and find meaning in large volumes of data. When information professionals talk about reliability with respect to the Internet, they typically focus on query results. However, greater focus needs to be placed on source reliability. One solution could be a three-pronged approach. Greater emphasis should be placed on teaching information literacy. Starting in elementary school, students need to learn how to critically analyze information and its sources. This critical analysis needs to become habitual. The means to analyze information within our current systems needs to be widely adopted. Dating information is an important first step. Press releases are notorious for not having dates. This is unacceptable. Additionally, profiles, such as those on LinkedIn, could be enhanced with a date of last modification. By displaying modification dates, users can quickly determine currency. Finally, information validation applications should be built. Applications could search across social networks using known names, facial recognition, and any other known biographical information. From a broader perspective, an application could fact check news reports by analyzing differences. Those differences could be highlighted and summarized. As our information systems age, information reliability will increasingly become important. While information management and query-results reliability are important, information reliability is equally important. If we do not teach information literacy at an early age, adopt the means to analyze, and create applications to assist information validity, we will spiral downward into a misinformation glut where "good enough" won't even be good at all. Other sources that may be of interest. Video: Library from Joseph Tatum on Vimeo. Joseph Tatum's video work as a student is impressive. Check out his work on Vimeo and his well-designed site. Video: St. Vincent "Cheerleader" from Hiro Murai on Vimeo. Great song by St. Vincent directed by Murai with an homage to Ron Mueck. Columbus-based artist Stephanie Rond's Toys and Tools solo show is coming up. Check out Rond's innovative style where street art blends with "human nature, animal instinct, [and] gender." For more info on Stephanie, check out her site. 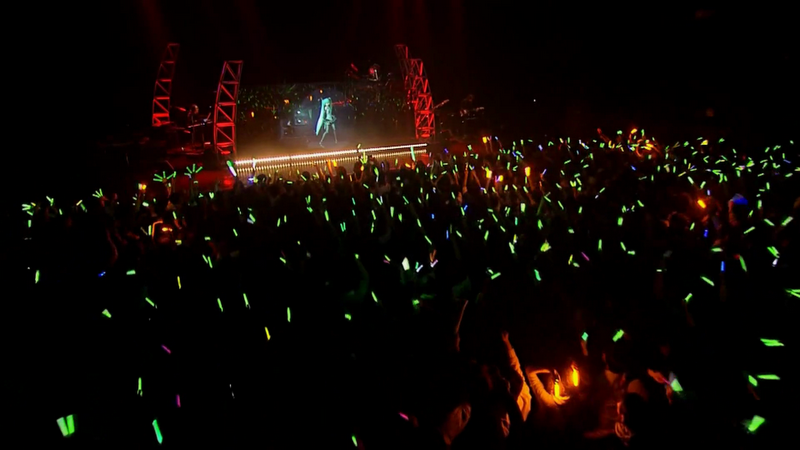 Image: Hatsune Miku in Concert Courtesy of Everyday Me. Recently I've been pondering our ability to recreate the human experience--both in in the virtual and real world. 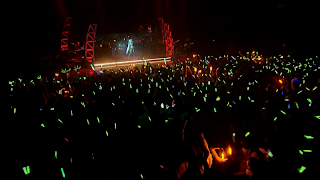 I was surprised to learn about Hatsune Miku. Hatsune is a completely computer animated "singing synthesizer application" (Wikipedia, 2012). 2,000 people have been willing to fill a venue to be entertained by a proxy for an artist. Of course, the music and animation were all created by artists & designers, but we are already at a point when computers are "quickly doing things that the programmers hadn’t planned for," including music, visual art, and language. A few days ago, I came across Next Media Animation (NMA). NMA is a computer animation studio and a unit of Next Media Limited, "the No. 1 source for print and online news in Taiwan and Hong Kong." NMA reenacts news events where images or videos can not easily be obtained. The video below is of Charlie Sheen's infamous escapades. The animation does not exactly replicate the individuals, but what if it did? What if in the future, these kind of reenactments are so lifelike that we cannot discern between reality and artifice. This calls into question the ownership of our likeness (aka personality rights). Can our likeness be owned? Can it be owned after our death by an estate? In the case of Steve Jobs, can a company own your image? Video: "The Box Man" by and Courtesy of Nirvan Mullick. While Caine's Arcade is rightly getting a lot of air time, I thought I'd highlight another of Mullick's gems, The Box Man. It's a great short animation that makes me miss film festivals of yore at Little Art Theatre (not that Spike & Mike rubbish, more like the goodness that is known as the National Film Board of Canada). Image: "Linking You to the World" by & Courtesy of Aerosol Warfare. This fantastic mural is a result of the collaboration between a public entity and street art. The Houston Public Library (HPL) did not have the funds to include their parking garage in their renovation. However, HPL's staff suggested reaching out the Aerosol Warfare's CKC StART Street and Urban Arts, a program "whose mission is to promote street, urban and alternative forms of art as a positive and creative force in communities." Aerosol Warfare energized a space and extended the HPL's theme of "linking you to the world." The collaboration between the library and the studio is a great example of how street art can play a role in urban renewal. Here's a nice slide show by Gonzo247. Downtown HPL Artwork Dedication from GONZO247 on Vimeo. This beautiful mixed-media piece was commissioned by Valdosta State University's Odum Library in honor of William H. Mobley IV, a Valdosta native and former curator of the Library of Congress Archives. "Suddenly a universal piece about joy, support, aspirations, and promise, is wedded to the specific: here, locally, through books donated by Mobley, through the library and the university, the sky becomes the limit of student aspirations." For more information about Mobley, Amaki, and Odum, please visit their blog post here. Image: Smuggler Courtesy of the Andersen M Studio. Video: Going West Animated by Andersen M Studio. Andersen M Studio, the folks who directed and animated the Pottermore video below, is a brilliant studio based out of London. Besides film, they also work in photography & music, and their recent clients rightfully include some very well-respected companies. Carlisle created an amazing & inspirational trompe l'oeil mural on the ceiling of the school's library & media center. Columbia University's Department of Art History and Archaeology has a beautiful space for their slide library. The wall was collaboratively designed and constructed using new material and fabrication techniques. To learn more, visit Marble Fairbanks. In March 2011, I had the privilege of presenting the following presentation with Meghan Musolff, Assistant Coordinator of Visual Resources at the University of Michigan. We presented at the Visual Resource Society and Art Library Society of North America's joint 2011 conference, and we discussed current productivity technologies as well as potential future variations on today's technologies. We tackled task, project, and information management. In my section, I expanded on those three categories to envision future scenarios by mashing up the categories with artificial intelligence, simplicity & precise utility, simplified realities, dashboards, and ambient information. It was a great experience, and I am very thankful for the opportunity. Some of the categories, tools, and concepts discussed include the following: futurism, Dentsu London, BERG, project management, information management, task management, lifehacks, social bookmarking, diigo, delicious, aggregators, bloglines, google reader, onehub, doodle, teuxdeux, remember the milk, wunderkinder, evernote, wunderlist, microsoft surface, OLED displays, 5pm, basecamp, wrike, zoho projects, clarizen, artificial intelligence, readability, augmented reality, incidental media, mixing media, media surfaces, screen technology, ambient information, and rainmeter. The new County of Los Angeles Public Library opened in Oct. 2011. 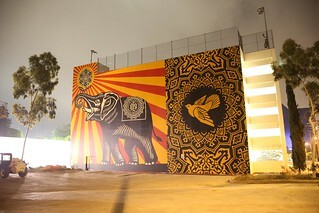 The county in collaboration with Cadillac and L.A.'s Museum of Contemporary Art installed a number of public artworks. In the video below, Shepard briefly describes his work.